Boats arrive at the Pending wharf 6 km to the east of the city. Getting there/away: Chin Lian Long buses No. 1A, 17 and 19 go to the express boat jetty in town. 60 sen one way. Taxis usually charge RM10. In Kuching, there are old Chinese temples, Brooke era buildings with unique architecture, waterfront park, observation towers and museums. There is a wide range of accommodations ranging from budget hotels to luxury 5 star hotels. After a long day, you can feast yourself with local delicacies such as seafood, chicken rice, Malay Nasi Lemak and chinese noodles. 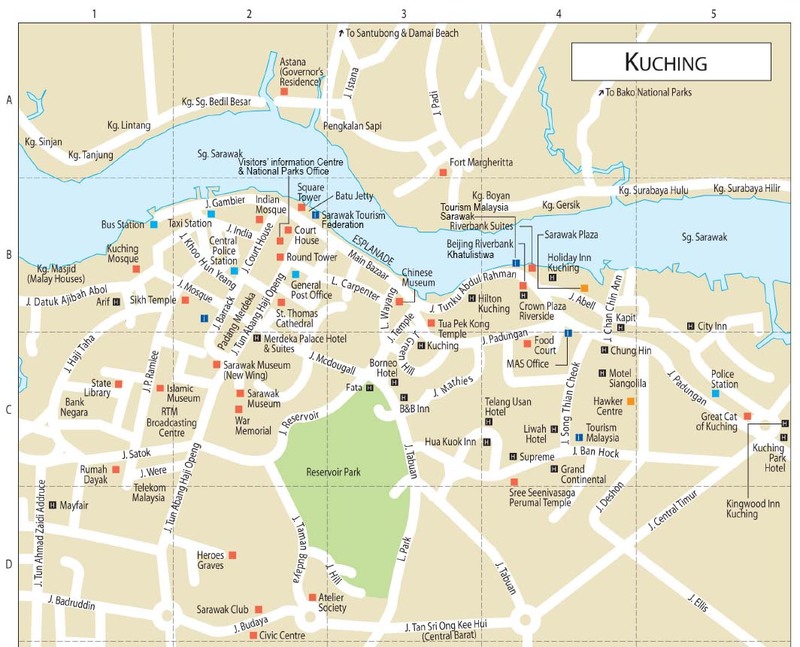 Kuching's name is originated from many sources. In the Malay language, Kuching means cat. Some sources say that Kuching originated from the Chinese word "Gu Chin" which means harbor. Another sources say that Kuching is named after a lychee like fruit called Mata Kuching (Cat's eye). Kuching's hotels have banded together to offer a free City Tram (really just a bus) service that shuttles around major sights once every hour. Ask for a City Tram sticker and route map from a hotel lobby. Kuching is unusually pedestrian-friendly for a Malaysian city, with tree-lined sidewalks and pedestrian crossings, and the city core is compact enough to cover on foot. Good walks include the Waterfront and the pedestrian shopping street of Jalan India (Kuching's Little India). If you're looking for a change of scenery - but don't want to stray too far from the city, then Kuching is the ideal place to be in. Most of the National Parks and other outdoor activities are not located far away. In less than an hour, you can be transported into a world of lush rain forests and fresh air, and than be back in Kuching before dinner time! Some other interesting areas near the center of town include Padungan Street, which is the main Chinatown area of the city. Shops here appear virtually unchanged from 20 years ago, and offer fascinating insights into life as it was then. There's some interesting shopping in Kuching. For a wide selection of tribal handicrafts and touristy gewgaws, head down to the aptly named Main Bazaar street on the Kuching waterfront. It's worth going inside for a look, as many shops have larger and more authentic collections hidden away upstairs or in a back room. The Malaysian currency is the ringgit. ATMs are widely available in cities, but do stock up on cash if heading out into the smaller islands or the jungle. Credit cards can be used in most shops, restaurants and hotels, although skimming can be a problem in dodgier outlets. Tipping is not customary in Malaysia. However, hotel porters and taxi drivers will appreciate a small tip if you have been provided with exemplary service. Most expensive restaurants, bars and hotels may indicate prices in the form of RM19++, meaning that sales tax (5%) and service charge (10%) will be added to the bill. The sole official language of Malaysia is Malay (Bahasa Malaysia). English is also taught in schools and widely spoken in the cities although in rural areas a little Malay will come in handy. Broadband Internet is available in most hotels, cafes which offer free WiFi for customers, and some restaurants and cafes. Both cable broadband and wireless broadband (available in hot spots areas such as Starbucks and McDonald's) are available. In general shops open from 10.30am till 9.30pm in the large cities. They open and close for business earlier in the smaller towns and rural areas. For a list of public holidays click here.